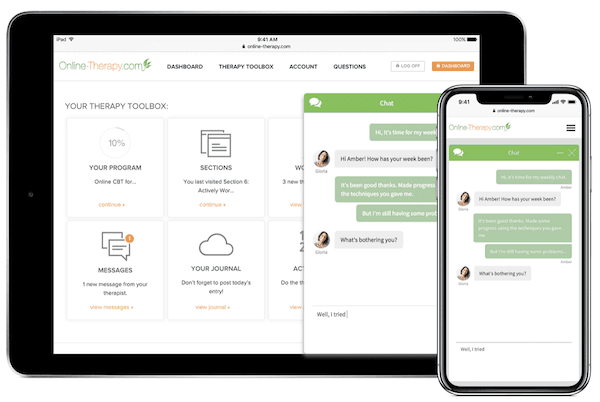 Founded in 2009, Online-Therapy.com has separated itself from other therapy services by creating a science based therapy platform that incorporates elements of cognitive behavioral therapy with live chat therapy sessions and hands-on tools to help you overcome your problems and live a happier life. Each program is custom tailored specific to your needs. If you're seeking help for depression, the program would be specific to depression. 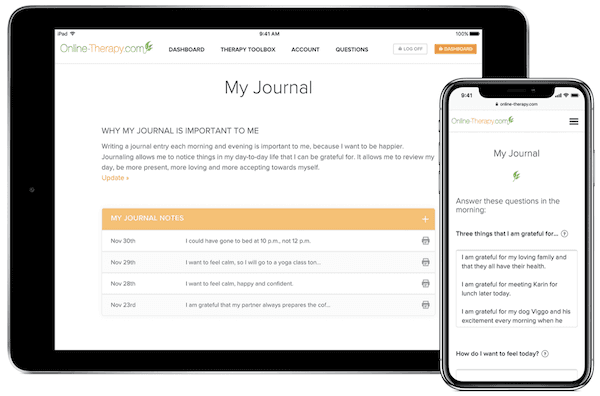 Each program includes live chat with your therapist, worksheets to complete, a daily journal, activity plan, yoga videos, numerous hands on tools and unlimited access to your counselor. Every therapist on the Online-Therapy.com platform has all required education, state licenses, certifications and at least 2,000 hours of real world experience. The team of counselors is lead Margaret Sweet who has penned fours books and roughly 200 ebooks that deal with topics related to mental health and cognitive behavioral therapy. When signing up for Online-Therapy.com, you can remain completely anonymous. You are under no obligation to provide your real identity when communicating with your therapist. Each therapist is bound by the same confidentiality and privacy laws that a traditional therapist is subject to. You can send your therapist an unlimited number of messages using the back-and-forth (not real time) messaging system. For one-on-one live chat sessions, you are allowed two 30 minute sessions per week (if you sign up for the premium subscription). Live therapy chat sessions take place in real time between you and your therapist. The cost of Online-Therapy.com varies based on which subscription package you select. At the time of this review, three plans are offered: the basic plan costs $39.95 per week, the standard plan costs $59.99 per week and the premium plan costs $79.95 per week. 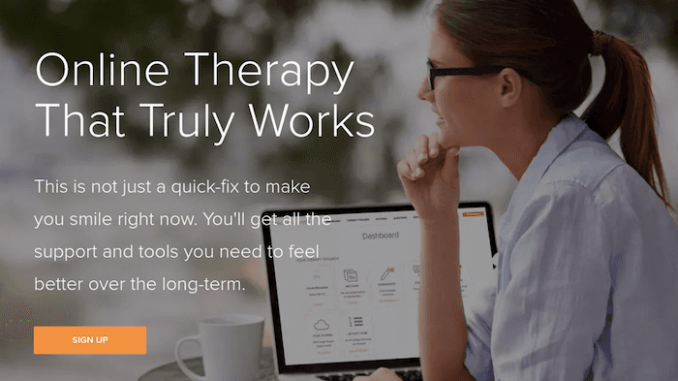 Online-Therapy.com stands behind their platform 100% and they offer a 14-day money back guarantee with every subscription. If you are not satisfied with the program or you results within the first 14 days of your purchase, you can request a full refund. Promotion: For the month of April, Online-Therapy.com is offering a 20% discount to all new members. How much does it cost to join Online-Therapy.com? Online-Therapy.com prides itself in offering all the tools you will need to maintain a happier life and brighter future. While communication with your therapist is a significant part of their therapy program, they also offer many other hands-on tools for you to take advantage of. As with any online therapy service, you will be assigned a licensed therapist upon signing up. Your therapist is available to talk to 24/7 through various modalities, including worksheets, messages (similar to email) and live instant messenger chat. I go into details about each of these below. Each therapist is guaranteed to possess a wide range of credentials. This includes all applicable academic degrees, licenses and certifications. Beyond certifications, each therapist has many hours of hands on-experience. The therapist you are assigned when you join will be the same therapist you communicate with each time you have a question. Your counselor is assigned to you based on the information you provide when signing up. If you feel like you don't “click” with your therapist you can request to be assigned a new therapist at any time from within your account. One particularly unique feature specific to Online-Therapy.com program is the “sections” area inside your account. Sections are like a chapter in a book. Each chapter contains specific information related to the therapy you are seeking. For example, if you are seeking online therapy for anxiety, the chapters will contain reading material and worksheets that are specific to anxiety. There are a total of eight sections for you to complete. Each section builds upon the previous section. In the end, you will learn how to refactor your thought process and replace negative/dysfunctional thinking patterns with positive thinking patterns. Where the “sections” are the reading material, the worksheets provide a more hands on way to internalize and make use of what you've learned in the section. After you complete each section, you will be presented with a worksheet. These worksheets will ask you questions to contemplate and answer. Your answers will be received and read by your therapist, who will in turn respond with advice, insightful tips and other recommendations. You are encouraged to maintain a daily journal which can be managed from within your account. The idea is that by writing down your thoughts once or twice a day, you will be able to look back and reflect on what you've written from time-to-time to ensure you are progressing on your therapy journey. The contents of your journal will remain private – it will not be shared with your therapist. Similar to the journal, the activity plan allows you to schedule tasks in your life. A written agreement of sorts between you and yourself. By taking the time to schedule activities, you are more likely to be accountable and to follow through on these activities. The activity plan also gives you a birds eye view of your social activities for a week. It’s important to try to do something everyday, so if you see days that are empty, you can plan something for that day. The yoga videos are a great addition to the tools included in the Online-Therapy.com program. Yoga is a proven method of relaxation and a great way for coping with depression, stress of anxiety. From within your secure account, you can access a vast selection of yoga videos. These are mostly beginner yoga poses that anyone can perform and benefit from. While you can communicate with your therapist through worksheets or through messages, as a premium subscriber you have two 30 minute live chat sessions with your therapist – a total of one hour per week. During these live chat sessions, you can ask your therapist anything. They will respond immediately and offer help and guidance. Live chat sessions are conducted during normal business hours. You can send unlimited messages to your therapist using the integrated messaging system. Messages can be sent and received anytime during the day or night. Remember, these messages are not real-time chats. You will have to wait for a response from your therapist which could take up to 24 hours. You can securely access your account from within a web-browser. Online-Therapy.com does not require you download and install any special software. All internet-connected devices are supported: computers/laptops (both Windows and Mac), tablets and smartphones. All communications on their website are encrypted using military grade 256 bit encryption. This means all communications between you and your therapist cannot intercepted or disseminated by malicious hackers in any way. You are under absolutely no obligation to use your real identity when talking to your counselor. You can remain completely anonymous on the platform if desired. Note: You will need to use your real name when supplying your billing details but this is never shared with your therapist. Overall, customers are happy with the therapy service provided by Online-Therapy.com. After browsing independently verified reviews, the following are a few in particular that stood out to me. Customer support is available 24 hours a day. You can contact their support department via live chat or by email. 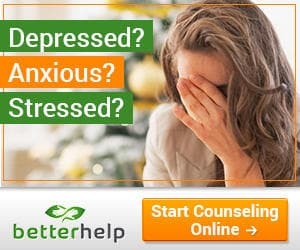 Online-Therapy.com offers three different packages to choose from. Each package is billed on a weekly basis. The basic subscription package is billed at $39.95 per week. This comes out to be $159.80 for an entire month. The basic subscription only gives you access to daily therapist worksheet feedback. It does not include any live chat therapy sessions in any capacity. The standard subscription is billed at $59.95 per week which breaks down to $239.80 for an entire month. This package includes daily therapist worksheet feedback as well as unlimited messaging and a single 30-minute live chat therapy session each week with your therapist. This is the highest level package offered. It is billed at $79.95 per week which breaks down to be $319.80 for an entire month. It includes everything included in the standard package except you are entitled to two 30 minute therapy sessions (instead of one). Online-Therapy.com allows you to pay using all major credit cards (Visa, MasterCard, Discover and American Express) as well as PayPal. Online-Therapy.com offers a 14-day no questions asked money back guarantee. If you are not satisfied with the program or do not wish to continue the program, you can get a full refund. It’s worth noting that if you utilize any the live realtime chat time with your therapist, you will only be eligible for a partial refund.